Because I'm on a roll! 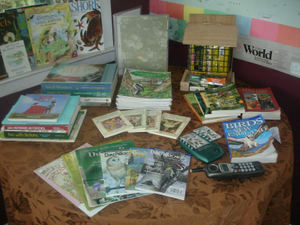 Yesterday I set up Earlybird's "learning wall" and today I reorganized his (our) nature/world corner. The map's the only new thing here (our old one was battered to bits). Everything else is old stuff - just rearranged in a new way. A storm candle - every summer we must have a storm candle! - and our Birdsong Identiflyer (currently sans batteries but I've got some charging downstairs). Also, a favorite little book of "Summer" poems and prayers. 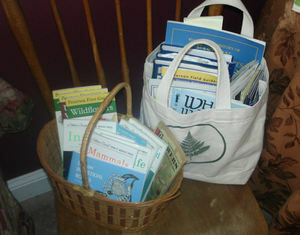 Baskets of books on the shelf underneath, and a basket of science and nature magazines. In the narrow space between the table and wall we have oversized atlas books. ... clearly, this basket is for Archie. So now I'm working on the family computer corner and mama's reading nook ... making summer changes, weeding out last year's stuff ... I'll be back soon to share more on all that! Many homeschoolers relish the practice - or at least the idea - of keeping a nature journal. Really, it's a wonderful tool for channeling those lessons learned through formal, or informal, nature study. Personally, I love the idea of a handmade journal, filled with notes and drawings and maybe even real-live (or once-live) specimens. This is my ideal form of nature journaling - for myself as well as my boys - but so far our attempts at paper journals have pretty much fizzled. We're good for a week or two, and then those new notebooks gets put aside. But finally, it's on to my photos for today! 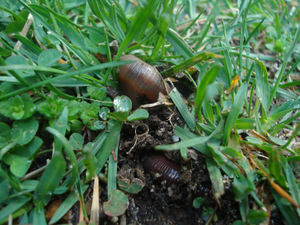 I have scads of them piling up, and since Spring moves fast around here, I'd like to share them before they get outdated! Thanks for listening to my thoughts on nature journaling, and thanks for checking in to see what we're up to! 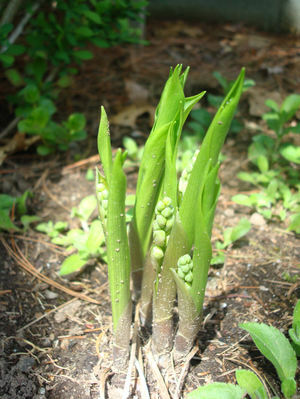 The first tender shoots of what I believe to be lilly-of-the-valley. 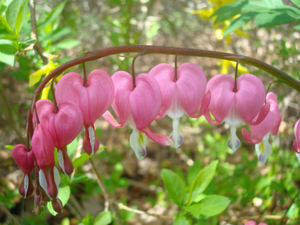 The bleeding hearts are, at last, in full boom. 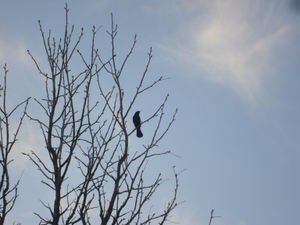 This is a red-winged blackbird at a local park. 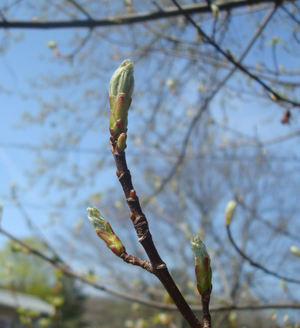 Tree buds a week ago - they've since opened! 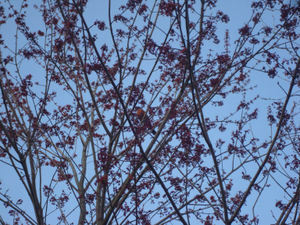 Can you see the robin in the evening light? 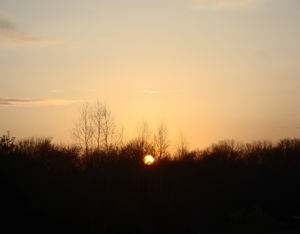 The last bit of sunset. 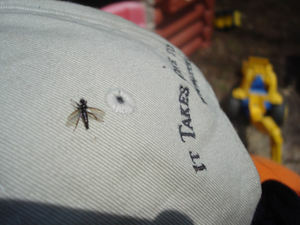 Photograph by Bookworm ~ a baby dragonfly (?) resting on my hat! 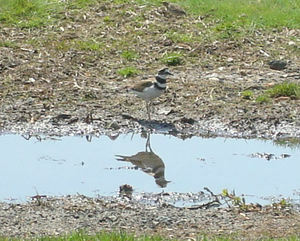 A killdeer we spotted at a nearby lake. 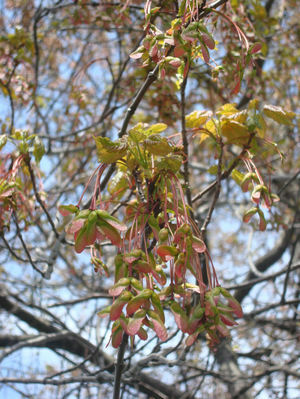 I loved the way these tree buds (blossoms, leaves?) looked in the sun. We found an owl pellet at the base of this tree, so we think this is a nest! These will become helicopter seeds in the fall! 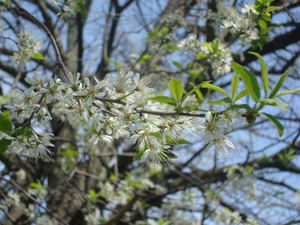 A lovely but unidentified flowering tree, pretty against the blue. A johnny jump-up I'm attempting to press. 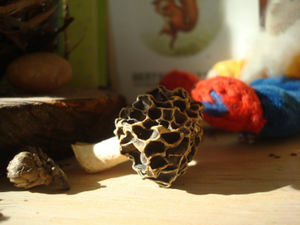 A morel mushroom we found in our yard; now it rests on our nature shelf. 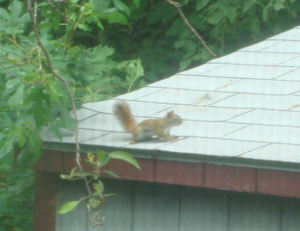 This cute little fella scampering across the top of our potting shed is our long lost red squirrel, Red Tail!! (Or, quite possibly, a relation.) Whatever the case may be, we have been months without a red squirrel at our feeders - ever since that fateful day last April - and I have truly missed his fun and feisty presence. My maternal grandfather was an amazing gardener and so I had the privelege of growing up knowing the joys of a home garden - the corn, rhubarb, strawberries, tomatoes, roses, dahlias and clematis ... and oh, the list could go on! One thing my grandpa taught me (one of the many) was that you could garden anywhere. My grandparents' home is on a lovely though small piece of land - certainly not country, and actually not far from a busy city. That did not stop Grandpa - he gardened as if there were no tomorrow. And we all benefitted from his endeavor. I would like to adopt a similar spirit, and turn my own small suburban yard into a haven for flora, fauna and family alike. 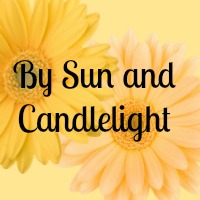 Now, two things I'd like to do for Jennifer's fair - talk briefly about my gardening plans for this year and share with you all a post from last year's garden journal, Marigolds for Mama. I hope that's not cheating, but I don't have many garden photos to show just yet this year! Do you know I have not been over to that blog in months? I made my last post on August 24th, when I talked about Late Summer Hues. According to the last line of that entry, I had hopes for posting more about the "turn of the seasons." Well, time got away from me, and I ended it there. 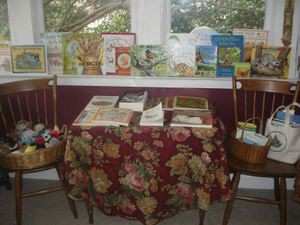 It was fun to read back over the blog, remembering things that grew and things the children did. 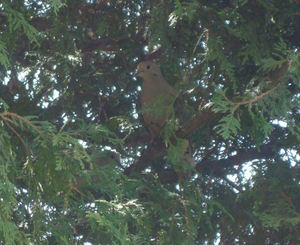 The following group of pictures was posted on May 15, 2006; the post was entitled, A Peek in Mary's Garden. In a corner of our yard, nestled beside a small potting shed, beneath the bowers of the flowering cherry, we have a semi-shady flower garden. Last year we added an Our Lady of Grace birdfeeder, and I was inspired to find out more about Mary Gardens. I just love how many plant varieties are named for Our Lady, and I was even more pleased to discover we had several kinds in our yard! I grew up with lilacs (they grow bountifully on my parents' property). They always bloomed magnificently right on Mother's Day when vases full of them would adorn our family brunch. We have them all over our yard too, but I must admire them on the outside nowadays, as I married a man who is severely allergic to these beautiful blooms! 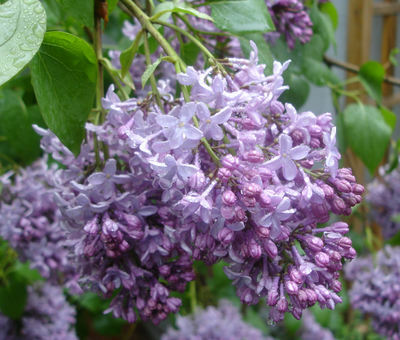 According to legend, lilacs are known as the Ascension flower, and that would be of course because they bloom right around the date of this feast (which this year is May 17th). 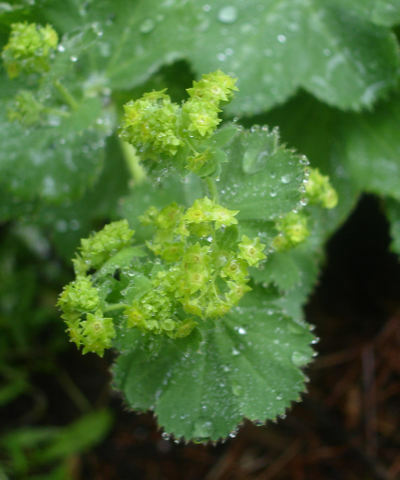 I'm embarrassed to say I don't remember much about this plant, but I found some lovely information here. 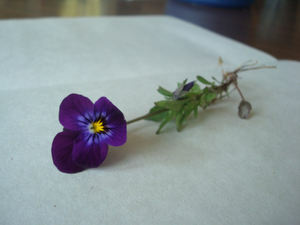 I absolutely loved these tiny pert flowers, and of course, I love that the plant's English. I will be buying some more this year. 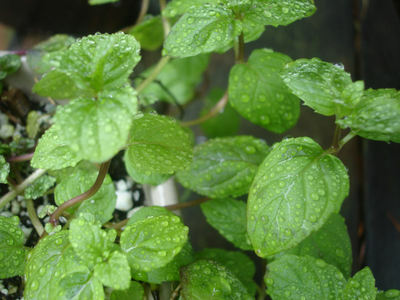 The spearmint grew well last year, and I will have to watch for its return, as it is a perennial. (Now where did we tuck it?) 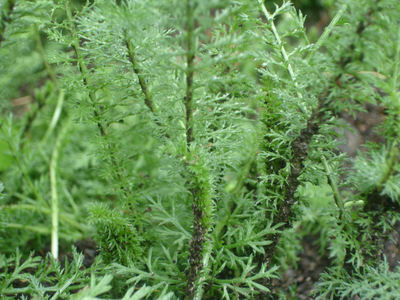 I would like to add more herbs to the garden this summer and do more with them too - perhaps learn how to dry them/preserve them and how to turn them into little gifts and things. This bush right now has just the tiniest red buds on it. 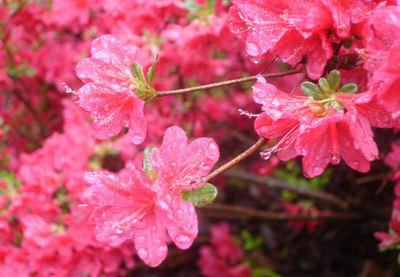 It is out front by our walkway and blooms beautifully each year. I forgot just how beautifully! 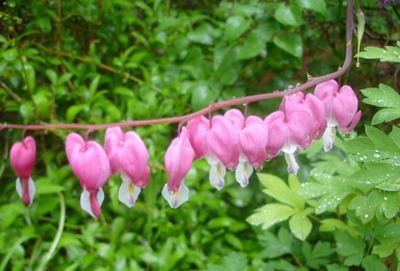 My grandfather had an enormous bleeding heart growing behind his house. Ours is still pretty small, but it already has some blossoms this year. 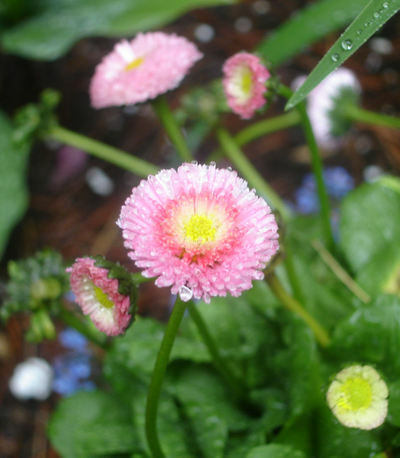 I think of this plant as old-fashioned and sweet, but I will always love it for how it reminds me of my grandpa. 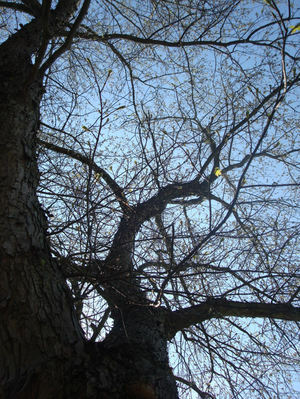 To me, its branches are reaching out, laden with love. First I am going to re-read some of my favorite gardening books. By far the best of the bunch are by Sharon Lovejoy, and later today, I'm going to pore over Sunflower Houses, Hollyhock Days and Roots, Shoots, Bucket and Boots - take lots of notes and imagine. We will be tending to the garden plots until then. Adding some compost and airing out the soil. Containers for the deck which gets full day sun. Vegetables: tomatoes (plum for sauce, cherry for snacking), Kentucky Wonder beans (for Dad), and, of course, zucchini! More herbs (basil for sure) and some edible flowers like nasturtiums. A rose bush or two ~ a variety that will bear lots of rose hips in the fall. A clematis for the lattice on the potting shed. Our raspberry bed is doing wonderfully! The plants are all growing and sprouting gorgeous green foliage. Last year we enjoyed gold and red raspberries by the hand-fulls after supper each evening. This year I'd love to grow enough to make jam! Our lavender bed is also doing well. It's part of a small knot garden out front. The bed needs to be pruned and cleaned up a bit. I hope to harvest lots from this patch. Sunflowers (giants!) and morning glories along the front fence. This fall, I hope to plant LOTS of bulbs including snowdrops, crocus and daffodils. I wish you a joyous Sunday and a beautiful growing season ... may there be a garden in your heart all summer long! Last week, as you all must know by now, (considering how much I've mentioned it!) 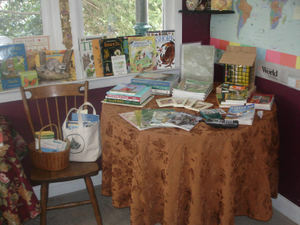 I hosted a homeschool support group meeting at my house and the theme was nature study. We were a small group of 5, but it was a fruitful and fun evening. 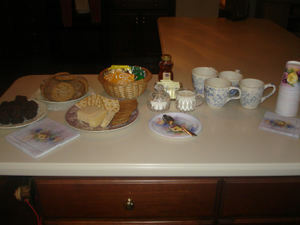 I'd like to share a few pictures of the set up with you, as well as some of my notes from the meeting. 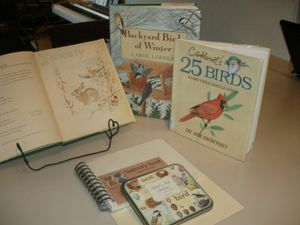 Our favorite puppets are made by Audubon and Folkmanis. 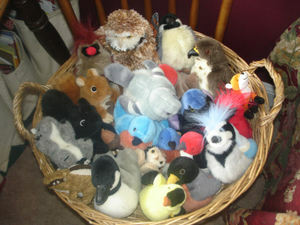 A great resource for puppets and all kinds of nature study supplies, is Acorn Naturalists. 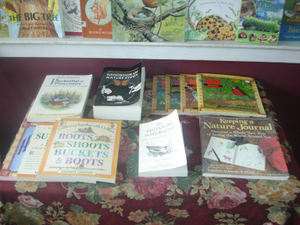 Favorites are Peterson First Guides, Golden Guides and Smithsonian Handbooks. 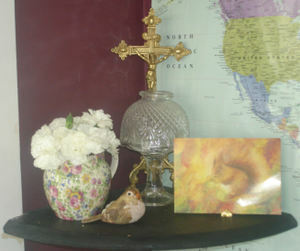 I even set up the prayer corner for the night, with a tiny paper mache bird and a postcard showing my all-time favorite nature study subject, a little red squirrel. So, did we talk about nature? Well, yes we did, but we also happened to be a group of good friends and, as any mother knows - when you get together with your mommy friends (without kids), you can hardly stop talking about all manner of things! Once we got around to the actual meeting we talked about whether or not our children enjoyed nature study - why they do (a love of bugs) or might not (a fear of bugs). 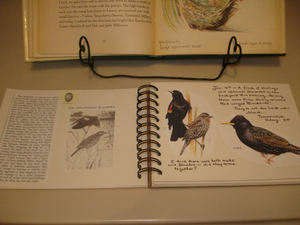 One mom brought a page from her son's nature journal - a wonderful collection of notes and sketches. This particular page was filled with comments on urban nature study, which led us to another aspect of discussion. What can we see where we live, here in the suburbs? Turns out a lot, as we compared notes on who's seen what - coyotes, foxes, fisher cats, deer, woodchucks/groundhogs, bunnies, squirrels, chipmunks, ducks, and birds of all kinds. We talked for quite a while about nature sketching and how for some children (and moms) it can present a real obstacle. One friend shared how her daughter gets quite frustrated when she can't draw things just right. She wondered if she should encourage her child to perservere or back off lest she turn her off sketching completely. We also spoke about the different ways children draw - some press their pencils very hard, some not enough, some prefer to trace and are happy with that. Our talk turned to art programs for a while. We discussed how nature study might lead a child to a certain career path - wildlife handler, nature park ranger, photographer, even a (biology) textbook illustrator. We talked at great length about what has happened to childhood in general over the past few generations - how we've slowly become an indoor, plugged-in society. 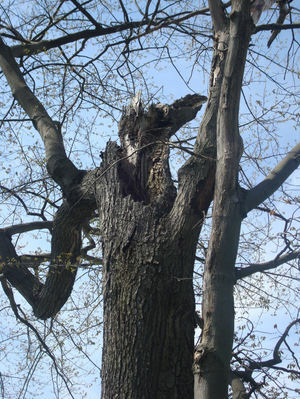 Many of us recounted childhoods spent out-of-doors (in the summer anyway) roaming all over, knowing the trees in our neighborhood so well. Today we face many obstacles to such freedom - too much stuff, too much busy-ness, too many distractions, too many stranger dangers. We touched briefly upon the book Last Child in the Woods (which I own but have not yet read). We didn't get around to it at this meeting, but later I spoke with one of my friends about the possibility of starting a small nature study group. Perhaps we could get together on a regular basis (once a month or every six weeks?) to do an activity, share journals and recent nature observations with each other. This would be a great way to do some larger group activities and allow the kids to encourage each other and fuel each other's interest in the outside world. We'll see what happens - I have yet to spread the word too far. Mainly a few housekeeping notes. For instance, I have added some new things to my blog, and I wanted to mention them. In My Notebook (see righthand sidebar). Some of you already have this feature on your blogs, or have seen it elsewhere, but just in case you are not familiar with it ... it is basically a way for me to highlight blog posts I am going back to read again. Sort of like a clippings file. Google Reader is like Bloglines - it lets me keep track of the blogs I read, and lets me know when something new has been posted. If a post is particularly interesting to me, I can just "share" it and it shows up in my little clip box over there. Neat! 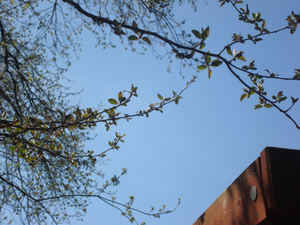 Early Spring Nature Study (also at the right). New photo album! 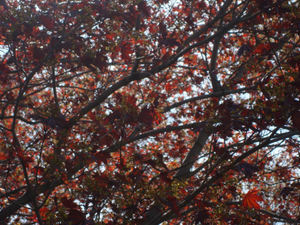 And this time, unlike my Winter Nature Study album, there is more than just ONE picture, lol! I aim to keep up with our nature albums better, especially since there is so much happening at this time of year. I've even added notes! The Nature Corner Widget (lefthand sidebar) or is it a Blidget? I forget. Whatever it's called, it's a neat way to show recent posts in another blog (most likely one of your own). It updates as soon as you publish a new post. So far The Nature Corner has been mostly just a place to deposit outdated nature notes, but as the new spring season opens, I hope to do more with it - make it a true virtual nature journal! Just now I posted a picture of this morning's crescent moon. 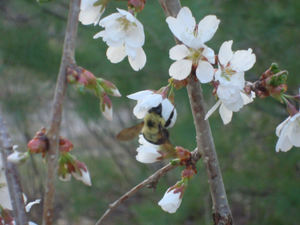 Spring fever has really set in, (and not just because the Sox beat the Yanks the other night!) ... 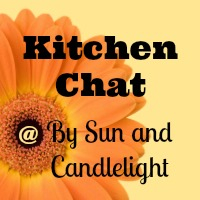 I am really itching to change my blog topper. Nothing too radically different, maybe just a different floral. I'm a bit tired of the pink and blue, I'd like something more in soft green and yellow, or maybe peach ... just thinking out loud! OH! And this just in ... Pirates of the Caribbean: At Worlds End opens May 25th. (Sorry I can't find a link that looks reputable.) As you can see, this news went right in my journal -->! Mark your calendars, me hearties, and have a great day! Foxes, Coyotes and Wolves - Oh My! We're talking about all three over at The Nature Corner today. Please stop by and take a look!